People with dietary restrictions, put your hands together for the most incredible Vegan Caesar that just so happens to be nut-free, oil-free, and gluten-free. People without dietary restrictions, go ahead and clap too. This salad RULES! While we’re at it, let’s give a round of applause to hemp seeds, the star of this dish and one of my all-time favorite foods. Of course I also have to give a shout out to liquid smoke! It may not be the healthiest of ingredients, but it sure does give tempeh bacon a delicious smoky flavor. Since tempeh bacon is infinitely better for you than bacon made from pigs, I call that a win. When I first became a vegan, I put all of my focus on creating recipes and dishes that tasted amazing, but put very little thought into the nutritional content of the recipes. I actually created a pesto recipe that uses 3/4 of a cup of olive oil! Don’t get me wrong, it is literally the best vegan pesto I have ever had. But I didn’t take into consideration that pesto addicts like myself could potentially eat the entire thing (a caloric indulgence if there ever was one) and I had no idea that there is a large group of vegans who don’t consume oil at all. To all my oil-free peeps, this one’s for you! Also to my nut allergy people and gluten-free people, I’ve got your back! My goal is to make plant-based dishes that are delicious and accessible to everyone, regardless of dietary preferences or restrictions. So I will definitely be sharing more recipes that meet these guidelines. Like this Vegan Caesar. It is SO good. A delightfully nutritious version of a classic Caesar Salad. With no oil, nuts, or gluten, this salad can be enjoyed by almost everyone and tastes amazing to boot! Slice the tempeh as thin as possible. Combine all other ingredients in a medium sized container with a lid. Stir to combine. Add the tempeh to the marinade. Cover the dish and give it a good shake to evenly coat the tempeh. Preheat the oven to 350 and let the tempeh bacon marinate for 15 minutes while you prepare the hemp parmesan and Vegan Caesar dressing. Line a baking sheet with parchment paper and arrange the tempeh bacon slices so they aren't touching each other. Bake the tempeh bacon for 15 minutes. Flip each slice of tempeh bacon then bake for another 10 minutes. Combine all ingredients in a small food processor. Pulse until the mixture has the consistency of parmesan cheese. Store in an airtight container in the fridge for up to 1 week. Wash the romaine lettuce and thoroughly dry. Cut or tear the leaves into bite sized pieces and transfer the romaine to a large bowl. Add all other ingredients to a food processor and process until evenly combined, stopping to scrape down the sides. If the Vegan Caesar is too thick, add water 1 tablespoon at a time until you reach your desired consistency. Add your preferred amount of Vegan Caesar dressing to the bowl of romaine. I generally use about 1/3 cup. Toss until the lettuce is evenly coated with dressing. Garnish your Vegan Caesar with tempeh bacon and hemp seed parmesan then enjoy! Recipe serves 4 as a side or 2 as a main. Vegan Caesar will keep in an airtight container in the fridge for up to 3 days. Soy Sauce may be substituted for Tamari if not gluten-free. 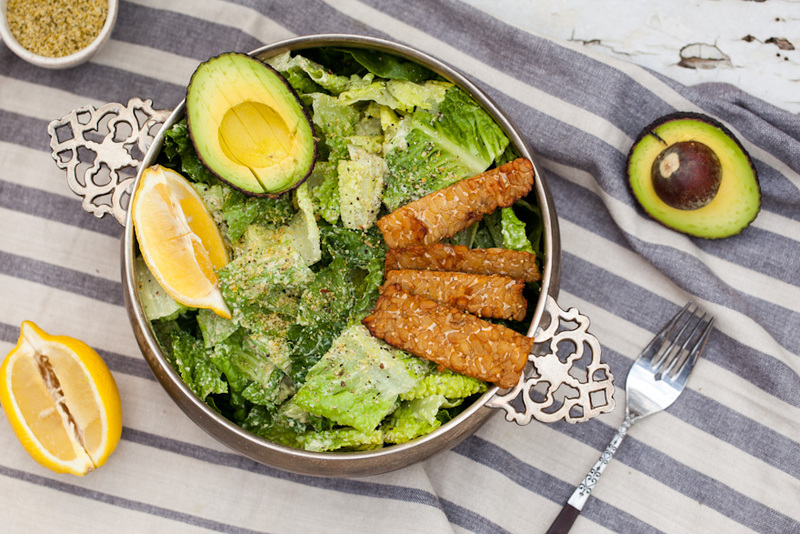 If you try this Vegan Caesar recipe, leave us a comment and tell us how you liked it. Don’t be shy! For bonus points, snap a photo of your salad and post it to Instagram with the tag #carrotsandflowers 🙂 We will do cartwheels of happiness and gratitude if you do this, it really makes our day! If you haven’t yet tried this Vegan Caesar recipe and want to save it for later, pin the photo below! Any suggestions on what to substitue for worchestershire sauce. I’m gluten free and it’s not. Thanks! This looks delicious and I’m wondering what kind of hemp seeds you use? Roasted, raw, hulled, brand? So many choices on Amazon as we don’t have anywhere to buy them here yet.